Belgian postcard by Cox, no. 25. On 22 January 2014, German singer and actor Fred Bertelmann (1925-2014) died. 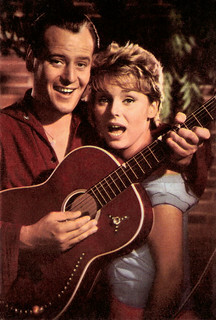 His biggest hit was the song Der lachende Vagabund (1957), which he also sang in the Schlager film of the same name. Cornelia Froboess (1943) was a teen idol in the late 1950s and early 1960’s and would later become a respected stage actress. For more postcards, a bio and clips check out our blog European Film Star Postcards or follow us at Tumblr or Pinterest.